Welcome to the Earth Day Edition of the Teacher Potluck Carnival! First, let me apologize for this being two days late. Blog Carnival was down, I had classes to teach and appointments to keep. I have made sure that the next carnival will be close to a weekend. Bobby presents a Chicken Alfredo recipe posted at Free OnlineRecipes. Bobby has convinced me that I can make this. Enjoy! Theo presents Review of Horizon Organic Fat-Free Plain Organic Yogurt posted at Organic Test Kitchen. This yogurt is not sold in the Northeast Kingdom of Vermont so I can't try it. But Theo has and I found it an interesting review. It taught me what to watch for in yogurts (which are big here with the many organic dairy farms). Organic Test Kitchen looks like a great blog that I'll be checking out more in the future. Finally, Leena Helttula presents Mathematics and Baking posted at Conceptis addict. I have enjoyed Leena's blog for quite awhile. She is a puzzler and introduces me to great puzzles. And now? She found a recipe for Sierpinski cookies! Can you believe it? Check out her blog! 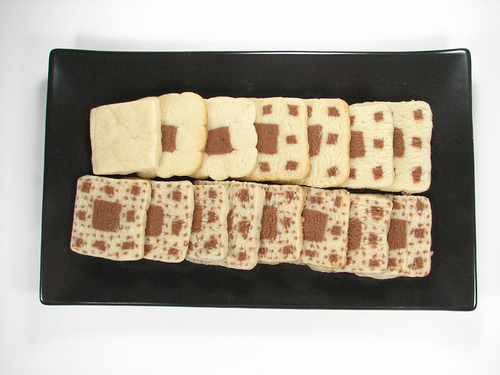 The photo of the cookies is from her site. She includes complete recipes for how to create them. Scott Palat presents School Discipline: Effective Strategies for Instilling Successful Classroom Discipline | posted at Colleen Palat. I enjoy articles like this because I believe we all need to be regularly reminded of these strategies. And finally, Eric Koshinsky presents How to Teach Speaking posted at Teachers Call. I present Vermont's First Annual Junior Iron Chef Competition. Middle and high school students throughout Vermont competed in an Iron Chef type competition in order to promote using natural and local foods. The video is from Stuck in VT. We are beginning a Farm to School program at our school and at many others in our district. The awful videos about mistreated cattle at slaughter houses helped push this program forward. You may want to check this movement out for your school. The next edition of Teacher Potluck Carnival will be the Memorial Day Edition on May 25. Be sure to submit early and often! SUBMIT YOUR TEACHER POTLUCK CARNIVAL POST HERE!